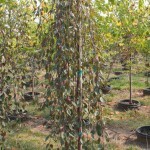 A small weeping tree with rich reddish-bronze leaves. The underside of the leaf remains purple. The fall color takes on orange and bronze tones. 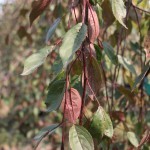 The deep reddish-pink flowers in spring are followed by dark red fruit. It has excellent disease resistance. 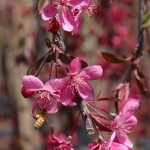 As with most Crabapples, it will grow best in full sun in a well-drained soil. This would make a lovely addition in the landscape as an accent or focal point.